Nap when your baby does. Cool and de-puff tired eyes with cucumber. 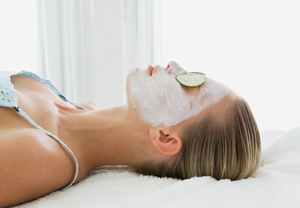 There’s a reason cucumber remains a classic eye treatment: it works. So lie down, pop a couple slices on your eyelids and enjoy a mini spa treatment while you nap. Or add Yes To Cucumbers Soothing Eye Gel to your early morning skin care routine. The Dead Sea mineral-enriched gel helps take care of puffiness and dark circles for a more radiant look. Hide dark under-eye circles with concealer. Baby kept you up part of the night? Use moderate-coverage, light-reflecting Quo Illuminating Concealer for a fresh-faced effect. Baby kept you up all night? Time for the heavier duty Quo Minerals Matter Double Concealer, which boasts both a full-coverage stick and blendable cream. A glowing complexion minimizes trouble spots like tired eyes. Rely on a performance skin care line targeted to your age, and you’ll see fast results. Etival Laboratoire, products available only at Shoppers Drug Mart, has a series geared to women in their 20s (Etival Hydra Collection), 30s (Etival Ener-C) and 40s (Etival Rederm). Plus, all Etival collections include a treatment formulated to banish the dark circles and puffiness of tired eyes. Clarins has two comprehensive product lines formulated specifically for women in their 30s (Multi-Active) and 40s (Extra-Firming). Join a mommy-and-me yoga or strollercise activities class. A workout can improve circulation, contributing to a bright-eyed and healthy glow.